Snowden remains stuck. He’s in limbo. He’s at Moscow’s Sheremetyevo Airport. He’s in its transit area. A source told Interfax he’ll meet with human rights organizations late Friday. Snowden invited a UN High Commissioner for Refugees (UNHCR) representative, Amnesty International, Human Rights Watch, Transparency International and Poland’s Krido Legal. Moscow officials weren’t asked to come. 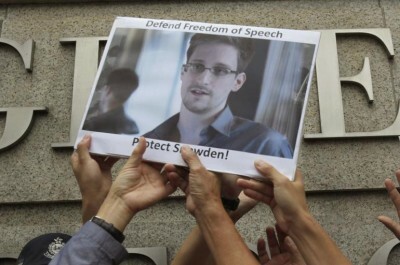 Russia’s human rights commissioner Vladimir Lukin said he’s willing to meet with Snowden. “I want to hear him out and then think what should be done,” he said. UNHCR, Amnesty International, Human Rights Watch, and Transparency International confirmed receipt of Snowden’s letter. Snowden confirmed Friday’s meeting. It’s closed to the press. He’ll say more later. He’ll do so publicly. He’s got plenty on his mind to relate. Millions worldwide await his comments. He told human rights representatives “(n)o actions (he took) or plan are meant to harm the US.” He “want(s) the US to succeed,” he said. He doesn’t rule out heading to Latin America. Travel dangers prevent him from doing so now. According to human rights lawyer Anatoly Kucherena, his Russian asylum request is written. Kucherena said he’ll provide legal support. Snowden met with representatives from 13 Russian and international human rights organizations. He called temporary status in airport limbo fine. He knows he can’t stay there forever. For now, he feels Russia’s his safest choice. Whether others will be later remain to be seen. “I assume that there are great risks” he’ll face capital punishment. “We do not have the right to let that happen.” Russia prohibits it. An official and implicit moratorium exists. No one’s been executed since 1996. Doing so inflicts cruel and unusual punishment. America executes prisons assembly line style. Russia Today’s given Snowden favorable coverage for weeks. Doing so shows official support. US telecom and Internet giants profit handsomely. They do so from spying lawlessly on customers. Rep. Edward Markey (D-MA) said AT & T charges NSA a $325 “activation fee.” It does so for each separate wiretap. A daily $10 charge to maintain adds more to bottom line profits. Verizon charges $775 for the first month per wiretap – $500 monthly fees follow. Telecom officials claim they’re not involved for profit. Human rights groups think otherwise. According to RT, the “average wiretap” costs US taxpayers “$50,000.” Telecom and Internet giants cash in handsomely. They’ve been doing it for years. In 2009, former New York criminal prosecutor John Prather filed suit. He charged several telecom companies with charging exorbitant fees. “They were monstrously more than what the telecoms could ever hope to charge for similar services in an open, competitive market, and the costs charged to the governments by telecoms did not represent reasonable prices as defined in the code of federal regulations,” he said. America’s a total surveillance society. It’s longstanding. It persists lawlessly. It’s out-of-control. It threatens personal freedoms. It shows police state contempt for what’s right. Free societies don’t do these things. In America, it’s standard practice. Corporate giants cooperate complicitly. They profit handsomely. Who said crime doesn’t pay? They do so through NSA’s Prism. It gives the agency access to search histories, emails, file transfers and live chats. It’s gotten directly from US provider servers. Doing so facilitates mass surveillance. Last July, Microsoft Outlook.com initiated encrypted chats. NSA “became concerned. Within five months, Microsoft and the FBI” solved the problem. Doing so lets NSA circumvent encryption. Since 2011, NSA worked closely with Microsoft. It gained easy access to Skype. Personal audio and video communications can be monitored. Skype has about 663 million global users. NSA shares information accessed with the FBI and CIA. America has 16 known intelligence agencies. On request, they all likely get what NSA collects. Microsoft touts its “clear principles” and guidelines. It claims respect for lawful norms and standards. It “take(s its) commitments to (its) customers” seriously, it says. Snowden documents prove otherwise. NSA claims it complies with “legally mandated requirements.” Longstanding lawless spying shows an out-of-control rogue agency. Efforts reflect “full-court press” bullying. Vice President Biden threatened Ecuador’s Rafael Correa. US embassies delivered Washington’s message. It did so throughout the region. This type bullying makes more enemies than friends. America’s influence peaked years ago. It’s waning. It’s long past time world leaders challenged what’s intolerable to condone. Doing so would neutralize tactics no one should tolerate. Venezuela offered Snowden asylum. It awaits his reply. US bullying complicates his plans. He remains in limbo. He’s unjustly called a traitor. America’s long arm threatens him. It does so wherever he goes. He sacrificed financial security and personal freedom. He’ll live each day like his last. He deserves global support for many more.